The Fabulous Journey of Raghavendra Rathore - Bold Outline : India's leading Online Lifestyle, Fashion & Travel Magazine. It was only a month ago that Rathore and Ermenegildo ‘Gildo’ Zegna first met in Italy’s Lake Como. And later it resulted in a worthy investment by Zegna and Reliance brands into Rathore’s titular label, which focuses primarily on bespoke menswear. Raghavendra Rathore (RR), a well-known Indian fashion designer, entrepreneur and belongs to the royal clan of Jodhpur. He graduated from the Parsons School of Design in New York, which inspired him to become a fashion designer. 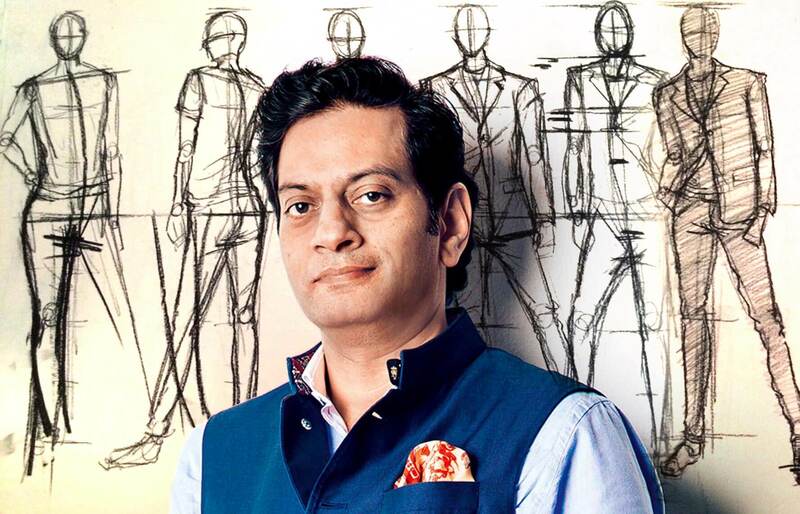 He has been active in promoting Indian heritage and culture through his special designed ethnic Indian apparel and is particularly noted for his Brand India image by having exclusive patent rights on Jodhpurs and bandhgala jackets. Rathore has worked with eminent fashion houses abroad starting with being an assistant designer for DKNY and working with Donna Karen and fashion labels like Oscar de la Renta and Bill Blass. His stint in New York provided him with the training and skill we see him master today. Thereafter, he planned to return to India and start his own brand by the name of ‘Rathore Jodhpur’ around the 90s, but gradually he went on to internationalize the concept of Indian clothing with his new fashion line under a brand called ‘Inde Pret’ which offered superior stylish Indian clothing. He has also launched a fashion label called ‘Blue Mantra’ for women’s Indian wear, that particularly deals with festive and bridal wear, which was his very first, as he had been focused on men’s wear for a good 15 years! He brought a new spin in Indian fashion and put it on the international fashion chart by bringing out designs that are contemplative of his Rajasthani roots – the Jodhpuri, bandhgala and which are his signature styles. Rathore’s collections, when displayed on the runways, have always won positive comments. Inspired by old-world grace and beauty, his attires have a characteristic mushiness, creativity, and flair colour combinations. He has revolutionised the fashion sense of Indian men and is well sought after by international clients who seek his unique clothes that display artful, tradition and current fashion trends. Rathore firmly believes that the future fashion styles would have an Indian flavour to it and wishes to contribute to the change. He has now expanded his creativity to include other businesses ranging from jewellery designing, kid’s wear, interior designs apart from women and men’s wear. 24 Hours to go! A Peek into Effortlessly blended traditional yet contemporary collection, exclusively curated for the Diamond Jubilee Celebration of AIMA. #AIMA #diamondjubilee RaghavendraRathore #Jodhpur #Bandhgala #Fashion #FashionShow "
Boucheron’s Bleu de #Jodhpur, this new High #Jewelry collection charts the borders of a contemporary and fascinating #India where innovation and audacity go hand in hand with the beauty of tradition. Between Jodhpur and Boucheron, the affinities are many and the love affair is obvious. Rathore brings across an aesthetic and grand complexity of the fineries of Rajasthan that are inspired from the heritage and craft of that Indian state. His work has found a lot of appreciation all over the world and he now has retail stores in various cities such as Goa, New Delhi, Mumbai, Greece and Hong Kong. The Shawl Project led by Tata Cliq Luxury, an online portal of luxury labels by the Tata group, brought out a clear picture of each designer’s signature art. RR’s black on black weave with a slim border was artistic, restrained piece of work. Recognizing the potential of the brand, the Ermenegildo Zegna Group and Reliance Brands Limited have jointly invested in Rathore Jodhpur. Rathore has been part of the lavish fashion industry for 25 years, with craftsmanship, legacy and touch of royalty at its core. This three-way partnership will be first of its kind and will aim at increasing the growth of the homegrown label as the foremost Indian menswear brand in the luxury space. Rathore has always been favourite for reviving two needless fashion styles of the era gone by – the bandhgala and the Jodhpurs. His design has made them iconic and fashionable, besides keeping intact the rich bequest of Rajasthan. He has also worked for many Indian film celebrities and has designed clothes for movies such as Eklavya and was lauded for the designer behind Amitabh Bachchan’s look in the first season of KBC. His nominative label, RR, is one of the go-to menswear designers in India. With traits of sharp tailoring and a moderate touch, his work is favoured by A-listers such as Anand Ahuja, Anil Kapoor, Arjun Kapoor and more. At present, this rebel designer has 30 stores across India, which speaks in volumes about his popularity in clothing that is aristocratic, advanced, and original.